Live phone consultation launches our most popular and successful service. Custom, detailed training program designed four weeks in advance. Tailored for you through your ongoing communication with your coach. Weekly coach initiated phone call will keep you motivated and on track for your goals. This is an open forum, where any and all triathlon related questions are welcome. Unlimited email correspondence between you and your coach. Additional services: video swim session, bike fit, run gait analysis, resistance training, etc. can be selected as needed for an extra charge. 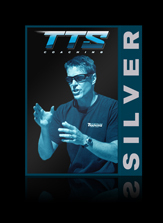 TTS Silver Coaching is $249/mo, with a 3 month minimum. Your account is billed monthly, and after the three-month minimum, you will have the option of altering your Individual Coaching plan, if needed. Upon purchasing your coaching plan, an email will be sent to you with a link to our online questionnaire. Once the questionnaire is completed, your TTS coach will contact you within 48 hours.